Blogs, News, and Other Things We Find Interesting. “SAGD short stories” is a blog series about SAGD and process operations. Centrifugal pump cavitation can generate excessive noise, waste energy, and damage pump components. 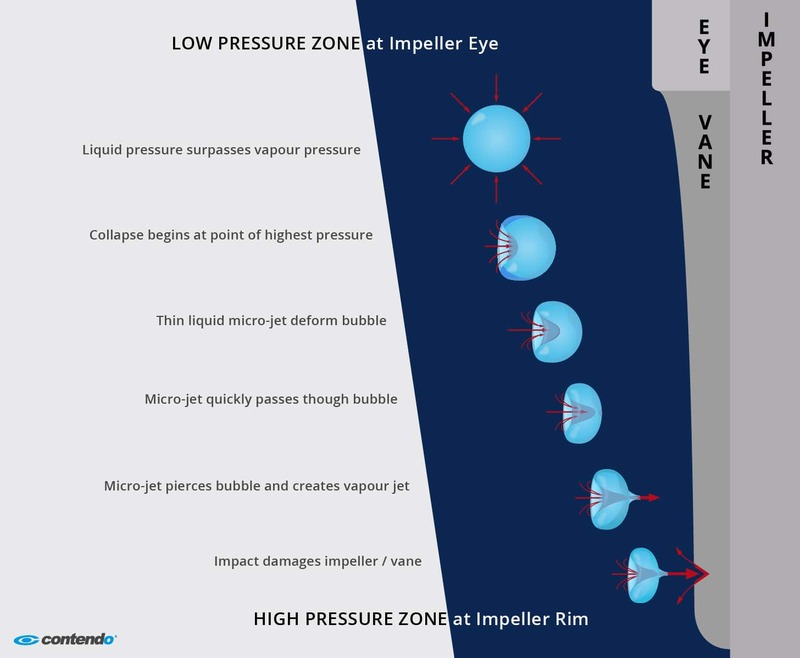 the relatively low-pressure zone near the impeller eye, which subsequently implode as the pressure increases toward the discharge. The implosions are like small detonations, creating intense, focused micro-jets capable of breaking away small pieces of pump material. While cavitation in a centrifugal pump is a serious concern for Process Operators, it is not confined to occurring inside a pump casing. In fact, a common example of cavitation is the stream of bubbles behind a fast turning boat propeller. Let’s go a little deeper on cavitation. In regard to cavitation, a pump impeller and a boat propeller have a lot in common. Both rotate in liquid and drive localized pressure changes. And both can create the conditions required for cavitation. As a propeller turns, the blade creates a high-pressure zone behind the prop to drive the boat forward, but also creates a low-pressure zone in front of the prop. If the prop turns fast enough, the pressure drop can reduce the water’s boiling point to below the water’s actual temperature, causing some water to literally boil. Vapour bubbles (think steam) spontaneously form in the liquid approaching the low-pressure eye. The bubbles are carried with the moving water into the high-pressure zone, where the water velocity slows and the pressure spikes. These conditions collapse the bubbles violently, with each bubble collapse being a tiny detonation. Cavitation causes damage to the pump because of the way the bubbles collapse. It is important to understand the increasing pressure is not applied equally across the entire surface of the bubble. Because of this, the collapse begins at the point on the bubble where the most pressure is forcing on it, like a finger pushing into a balloon. This collapse creates a liquid micro-jet that crosses the void of the bubble at high velocity, turning the void into itself. The velocity of the liquid jet, when it pierces the opposite side of the bubble, draws some of the bubble vapour into the liquid, creating a destructive vapour jet. It is the intense impact forces of these high velocity vapour jets that crack or chip pump parts. Cavitation events chipping away at a prop or impeller is called cavitation erosion, and can leave parts looking rough, with holes eaten through, or with blades and/or vanes almost worn away. FYI. An additional hazard of cavitation noise is specific to ships. In cases where naval actions are happening, cavitation can be heard for a long distance by military listening equipment, and can be used to target ships. The pressure changes forced on a liquid passing through a properly operating centrifugal pump can also induce cavitation. In regard to operating a pump, remember that if the liquid temperature is already near its boiling point, it will take less pressure drop to induce cavitation. can occur if the pump is starved. 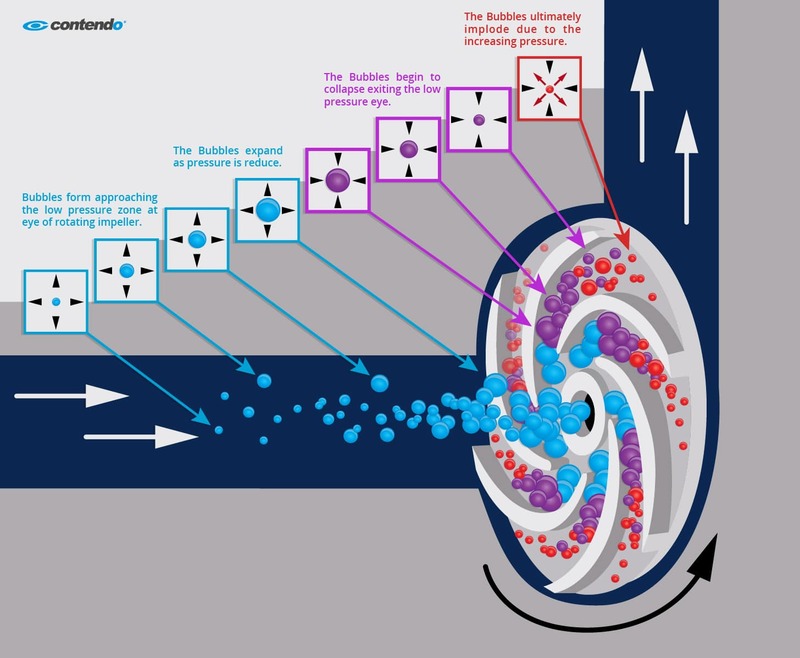 Bubbles will form at the impeller eye, and then implode on the face of the impeller. Poor design could result in suction cavitation if the pump operates too far to the right on the pump curve. can occur if the discharge pressure is so high it’s hard to get the liquid out of the pump. The velocity of liquid circulating inside the pump can create low pressure near the casing wall where bubbles form. The bubbles then implode on the casing wall and impeller tips. Poor design could result in discharge cavitation if the pump operates too far to the left on the pump curve. you can view Contendo’s SAGD Oil Sands Online Courses. Kevin Fox is a senior technical writer at Contendo. He is a power engineer who has written process education programs for industrial clients since 2009.